What a find! Wonderful surprise for our family. The cabin has breathtaking views and we enjoyed our stay every minute. The kids had fun in the hot tub adn of course the pool table. We want to come back every year. I was still traveling after my check in time and an agent called to check on me - I really appreciated that! Kitchen was the best. The cabin is well taken care of. We loved all the amenities that the cabin had to offer. We had an amazing time and can't wait to come back. The cabin was amazing. The view is gorgeous! We went to the rode to nowhere and the views driving there were beautiful. I wish we could have stayed longer. Can't wait to come back. We came up here for our honeymoon from Florida. The cabin is wonderful and it felt like home. IT had everything that we needed. We ate at Anthony's and The Filling Station. We had fun hiking and going to Cades Cove and Deep Creel. It was perfect. Thank you! Beautiful cabin! Beautiful Area! We had a wonderful time. This was our third time here. THank you for the new Keurig! Loved our stay once again and we will be back. 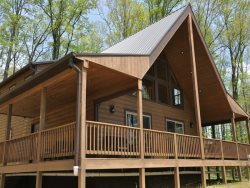 My husband and I stayed here with another couple for an early spring weekend. We had a great time! The cabin was very clean and has a beautiful view. Also has the benefit of being at the top of the hill so it feels very secluded. We had a great weekend hiking and coming back to the cabin to relax. There were a few minor maintenance issues but nothing that made our stay any less wonderful! Being pet-friendly was an added bonus. Privacy for each couple was great and it was just a short drive to town. We look forward to booking a return trip! Easy peasy! All the information was presented to us and everything was clear! Wonderful view. Pictures were accurate. Master with view of Mountains was the highlight. Okay, the kids loved the Jacuzzi, as did the adults. Wonderful View. Pictures were accurate. Master with a view of mountains was the highlight. Okay the kids loved the Jacuzzi, as did the adults. We really enjoyed the stay here at Above the Trees. Love the view! Beautiful, great cabin.